Small Google Algorithms Update This Week? Home > Google News > Google Updates > Was There A Small Google Algorithms Update This Week? 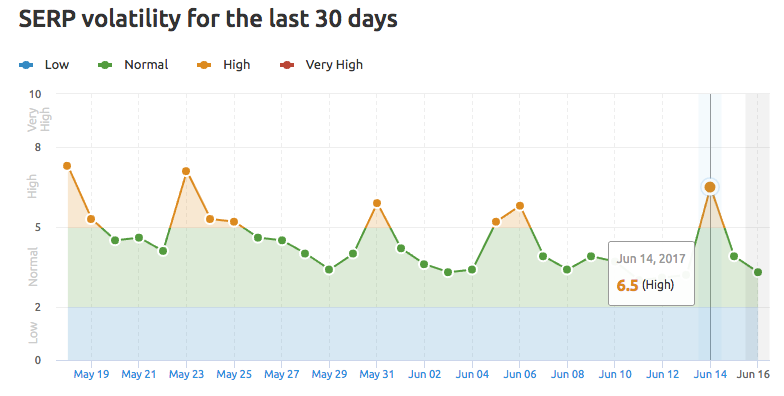 June 14th, or around that date, there may have been a small algorithm update in Google that webmasters somewhat took notice of. Yes, Google is always updating, they do a MILLION updates every second, but again, we track the ones that webmasters take notice of and that impact webmasters and their businesses. I saw huge changes yesterday in the SERPs I monitor. I big brand that was nowhere to be seen on many local searches is now #1 to #3. Mozcast has reported a value above 100 for a full 30 consecutive days. And this is the first month this year where I haven't seen a change in traffic from Google. The other tools are pretty stable. So was there an update on June 14th? Probably but I would not classify it as a big update that most of you would notice.